Short-nosed cattle louse Haematopinus eurysternus, from Quizlet. The Anoplura are a group of lice that have the mouthparts modified for sucking. All anoplurans are parasites of mammals. Species associated with humans are the crab louse Pthirus pubis and the head and body louse Pediculus humanus. Synapomorphies (from Grimaldi & Engel 2005): All thoracic segments fused; meso- and metathoracic terga reduced; tentorium completely lost; hypopharynx and labium modified into piercing stylets. [BE38] Babcock, O. G., & H. E. Ewing. 1938. A new genus and species of Anoplura from the peccary. Proceedings of the Entomological Society of Washington 40 (7): 197–201. [C70] Calaby, J. H. 1970. 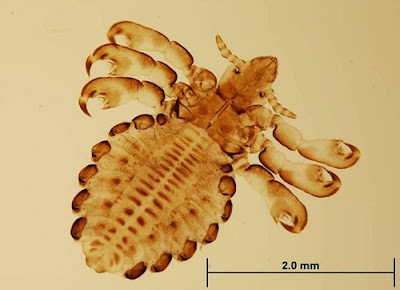 Phthiraptera (lice). In: CSIRO. The Insects of Australia: A textbook for students and research workers pp. 376–386. Melbourne University Press. [CM91] Calaby, J. H., & M. D. Murray. 1991. Phthiraptera (lice). In: CSIRO. The Insects of Australia: A textbook for students and research workers 2nd ed. vol. 1 pp. 421–428. Melbourne University Press: Carlton (Victoria). [R02] Rasnitsyn, A. P. 2002. Superorder Psocidea Leach, 1815. In: Rasnitsyn, A. P., & D. L. J. Quicke (eds) History of Insects pp. 125–133. Kluwer Academic Publishers: Dordrecht.